Oh hey!! How are ya??? So you know how I am renovating a home?? And you know how I have triplet boys that came into the world all squished together?? Well you can't all of a sudden just unsquish them when me their Mom has to keep a close watchful eye on them hooligans. Which only meant that the best option was the room right next to my bedroom. Don't worry the previous owners had that room sound proofed..they really did. Interestingly enough it is the only room in the home that they had sound proofed and they didn't even have kids..weird but it made for a win win situation for me and the noisies. So the boys new room isn't actually all that big but it did have one wall that was about 15 feet long. It all was coming together...3 boys..a smallish room...built in bunk beds. It sounded so efficient so we went with it. The estimate to build the bed was doable..especially after I presented the plan to my husband as being cheaper than buying 3 new beds..let's be honest though I withheld the IKEA bed plan this time and may have embellished a titch..no worries though I was on a mission of love and comfort for my boys...always boys first me second;) Who cares about design and a Pinterest dream anyway??? Hey at least I made the hardware on their beds a DIYer. Apparently I am not the only one who makes things out of plumbing parts because after I posted a picture of the hardware on Instagram a few of my design buddies chimed in to let me know that that had used the same concept for their curtain rods. P.S. - So far the only thing I would have changed or better planned out are the depth of the stairs between the bed. I'm currently trying to devise a plan on how to execute the best bedding plan so I don't go crazy making or having the boys make their beds every day. Making the beds on bunkbeds is not always ideal. Those beds are sooo stinkin cool. I've been waiting for you to post an update. 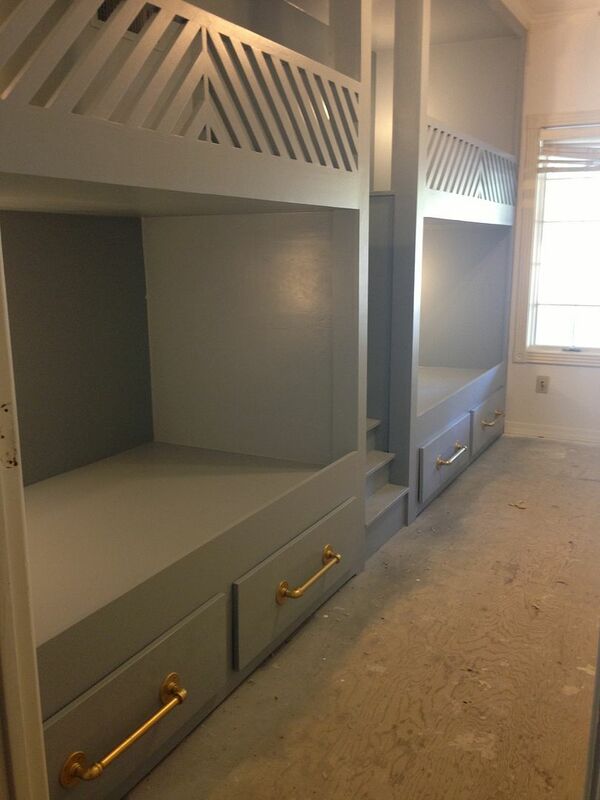 I have 3 boys of different ages, and built-in bunks are definitely a want for the next home. Do give a full report of the pros and cons of built-in bunks down the road please! Like are they a big pain to make in the morning? Your hardware is awesome. Love the brass+grey combo. Very chic but boy-worthy. Really excited to see more of your home and all the function you are undoubtedly including too, with 5 little kiddies. pretty amaze! Are they all giddy about who gets which one?? I can imagine the "crazy" parties in there! I was literally just thinking about your blog this morning and wishing for an update from you! It's fantastic as usual! I'd love Jason's number please. LOVE, LOVE, LOVE....They look amazing!!! Can't wait to see this room finished! a fantastic diy! I have loved this space from the moment I saw it. Your guys are gonna love it! So, I have a bed-making simplifier. On our bed, we don't use a flat sheet. We just use a fitted sheet and then we have a down comforter with a sheet duvet on top of it. No tucking in!!! And we even use it in the summer... the down is so breathable. Anyway, love all your choices! that whole bunk bed thing you got going on there is ridiculous. you got some lucky kids. I'm in Phoenix and just bought a house that needs a lot of work. I would live to get his contact information! Those bunk beds look fantastic! You are so cool and amazing! I cannot wait to see the rest of your house. I'm sure it will be publish-worthy! Thank you thank you everybody!! YES you posted more about these! To say that I'm obsessed with these is an understatement. I have this photo saved on my phone and I need to have it in my house one day. Maybe not for kids, but for real how awesome would girly slumber parties be in there? I think it would be a great friends getaway. LOVE this!!! 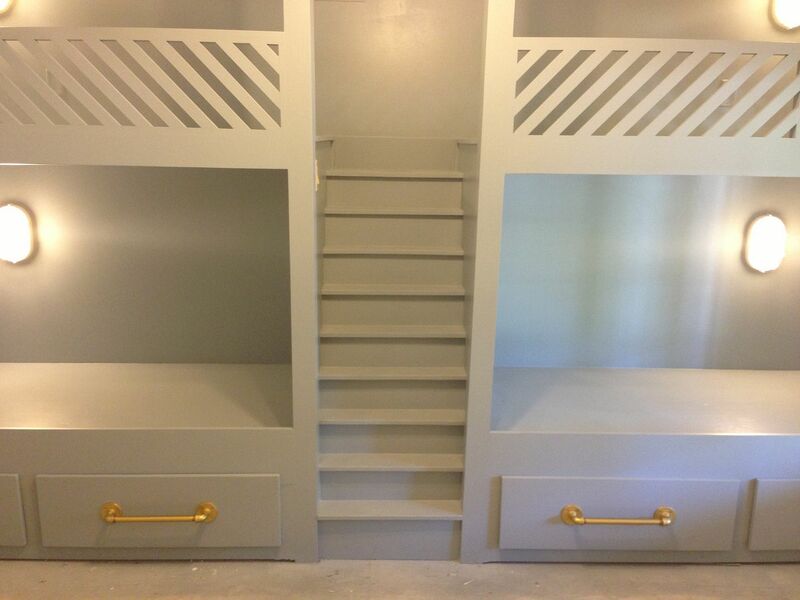 Love, love the bunks! Awesome execution. Ohmygah that is one of the coolest I've seen. Awesome job. Love the railing. My six yr old has twin over full bunk beds. Changing the sheets is hassle enough, I didn't want the job of making her bed fall on my shoulders every day (I have enough shiz going on). We pretend we're in Europe...just a fitted sheet and down comforter with easily washable duvet cover. No flat sheet or extra blanket. She's plenty warm and to make her bed all she does is fluff her pillow and fold the duvet at the bottom of her bed. Voila. It's been so easy I've changed all the girls beds to the same scenario. I cannot believe you did this! I LOVE everything about these beds and the DIY hardware is fabulous. this is the most fantastic idea EVER!!!! way to go, and thanks for sharing. Best of luck with your reno, the room looks fabulous! The beds look incredible! Never get a chance to stop by and say hello- but, always reading. You inspire me. This is my favorite "bunk room" layout. I love the drawers, lighting, stairs to get to the upper bunks. 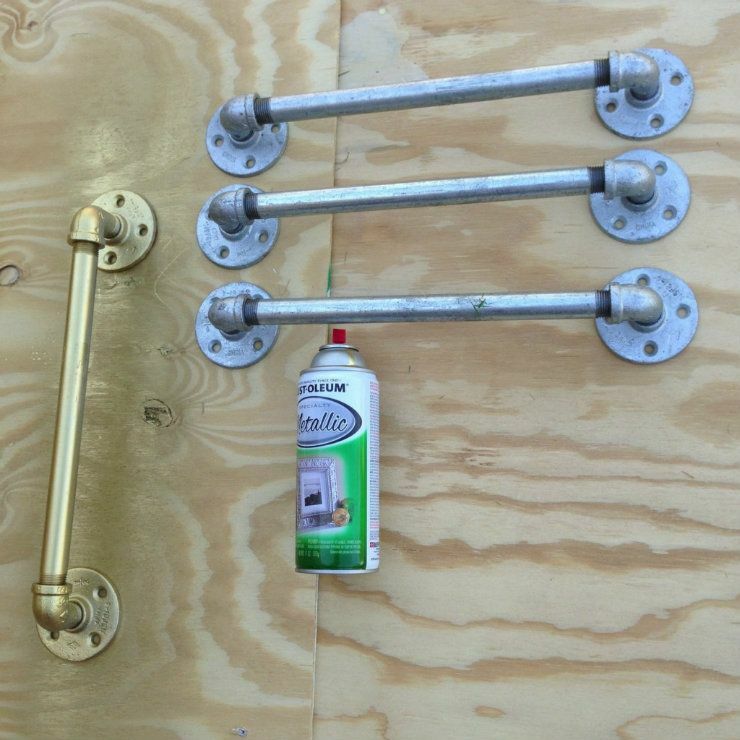 Your hardware selection and painting them brass is spot on! your boys are so lucky! WOW! this is fantastic! dropping by from Emily Clark. Ok this is amazing. The color you chose, the design, the hardware, it is all stunning! Momma of the year goes to you. How do you even have time with three boys?! My husband is a triplet as well- he's the only boy though! Absolutely love this idea!!! Absolutely perfect for your little guys' room!! The beds are amazing as well. I am also popping over from Emily's blog - and I totally recommend Clouds and Stars zip sheets. They make changing sheets sooooo easy, and especially for bunk beds! Thanks for these DIY, I'll follow the instructions written in your blog. Hello! I currently live in South Florida, but my husband is a Phoenix native and I have lots of family in the area, so we plan on moving back to the Phoenix area in June 2014. We are looking at areas with great schools and would love an older Ranch home on a big lot. We plan to renovate, too! I would love the name and number of your 'bed-maker'.... I am assuming he will make equally wonderful bookshelves, too!?!? Also, if it wouldn't be too much trouble, is there a neighborhood that you might recommend that fits my earlier description (good schools, big lots, ranch homes, older/good neighborhood) - we were looking at Mountain View High School in East Mesa. PS - Arcadia is out of our budget. Thanks! Love to watch stuff like that. So happy to be catching up with all of your exploits! Hey lady. How is it going? How is the renovation? Hard to keep a blog and get your house done at the same time no? UGh! Can't wait until mine is done. AMAZING! I would love the builders info, I live in Queen Creek! Thanks!! Very useful, thank you for sharing.The PIPO S1 also good! this is the most fantastic idea EVER!!!! way to go, and thanks for sharing a useful information for this blog. În formarea profesionalã nimic nu este mai important decât urmarea unor cursuri acreditate , cu lectori renumiti si capabili sã vã deschidã portile dorite. Expert Training vã garanteazã activitãti de specialitate si o arie vastã de cursuri acreditate, indiferent de ramura pe care doriti sã vã axati. Cursantii nostri îsi construiesc viitorul prin excelentã, apelând la Expert Training cursuri acreditate. If what you need is a change in your life to feel confident, prettier and healthy, our cosmetic clinic will provide you high quality services to make you feel all that. In order to achieve that our qualified team from cosmetic clinic will take care of you and indirectly rebuilding the self - confidence. Our cosmetic clinic Brisbane stuff will handle it with maximum discretion. Pentru cã o afacere profitabilã are nevoie de un site pe mãsurã, vã invitãm sã alegeþi procesul de creare magazin online de la Dehalo. Serviciile noastre pentru creare magazin online sunt orientate în directia succesului iar experienta de peste 4 ani îsi face simtitã prezenta în fiecare proiect realizat. Indiferent de profilul dorit pentru creare magazin online, Dehalo iti oferã solutia idealã. Trans.Eu oferă servicii de logistica. şi transport mărfuri, fiind platforma necesară oricărui client în căutare de schimb de informaţii referitoare la mărfuri şi camioane disponibile. Având peste 3.000.000 de anunţuri în fiecare lună, Trans.Eu asigură cea mai vastă gamă de servicii în logistică şi expediţie mărfuri. 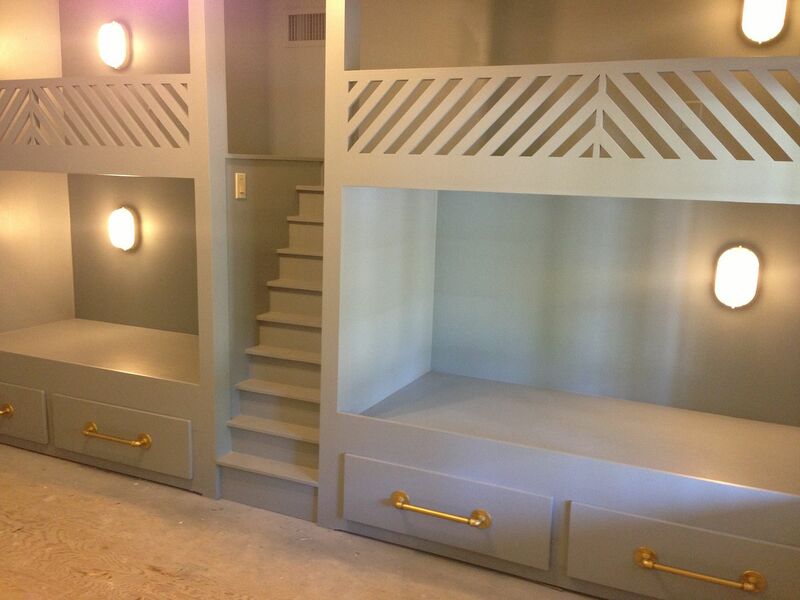 Those have to be the coolest and nicest bunk beds we have ever seen! Thank you for this awesome post and inspiration! Now I know why your blog is called Full House. Great beds! Contactați -l pentru mai multe informații , să fie clare și cinstit . Contact him for more information, be clear and honest. I didn't seen this design anywhere. I have just looked few designs that makes us to get admired. Really yours looks awesome. I'm wanting to do similAr bunk beds. Just curious, is the door coming into the room on the same wall or on another wall? Our long wall is on the same wall as our doorway, so I'm afraid it may look odd?